Wait... what?! I'm putting up a baking post? I've avoided this for quite some time because I make a massive mess whilst baking and also... I just can't take good photos in the kitchen! Here I am though, trying my best to make this post work! You can't go wrong with Tanya Burr's cookies though and in the end my attempt was a success! ...and as much chocolate as you would like! Note: Tanya Burr recommends using 200g of white chocolate and 200g of milk chocolate, but it's all up to you. I prefer not to have too much chocolate in mine so only use 150g of milk chocolate, however that may not be to your taste! 1.) Preheat the oven to 200 degrees Celsius/gas mark 6. 2.) Cream together the butter and the sugar in a large bowl using an electric whisk. 3.) Crack in a large egg and then whisk that in too. 4.) Sieve the flour and then gradually add and whisk this into the mixture. If it gets a little too hard to use an electric whisk then switch to a wooden spoon. 5.) The mixture should come together quite easily now, but if it doesn't add a little bit more flour. If the mixture is too crumbly then just add a dash of milk. 6.) Break up your chocolate bar and add it into the mixture, making sure it's evenly distributed. 7.) Line a few ( i used three) baking trays with grease-proof paper. 8.) Grab some cookie dough, roll it into a ball and place it onto the baking the tray. To make cookies of the size in the photos above, grab half a handful of cookie dough for each cookie. Tanya Burr makes slightly larger cookies and uses a handful of cookie dough for each one. 9.) Put the cookies in the oven for 10 minutes... make sure that you DEFINITELY DON'T put them in for more than 11 minutes! They don't look done when they first come out, but the cookies harden whilst they cool. Trust me (and Tanya), 10 minutes is enough time! 10.) 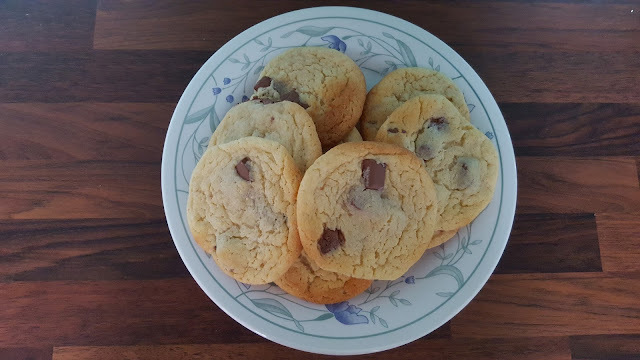 Let the cookies cool for another 10 minutes and then grab a cookie whilst they're still slightly warm (that's when they taste the best) and enjoy! 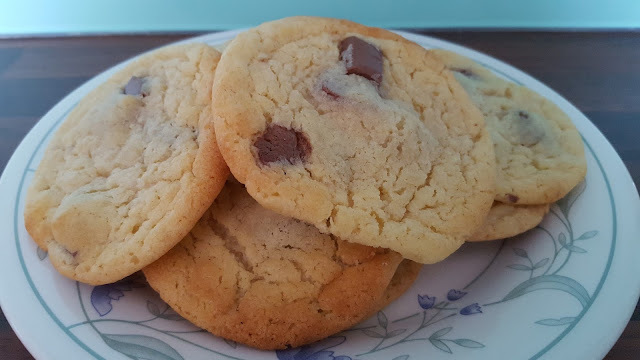 Click here to watch Tanya's original video where she bakes these cookies. Have you ever baked Tanya Burr's cookies?